Several factors are involved in planting a vegetable garden. As much work goes into planning as it does into the actual growing of the vegetables. Choosing a spot, preparing your soil, and deciding on which vegetables all have to happen prior to the actual process of planting. Once you’ve done the planting, most of the hard work is finished already. 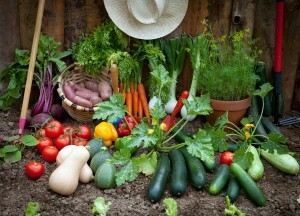 Basics for Planting a Vegetable Garden: sun, soil & seeds. All in one 101 guide: with tips, when to start and step. When choosing the spot where you will plant your vegetable garden, be sure to pick the sunniest area that you can find. At least 6-8 hours of direct sunlight per day during the growing season is an idea, but more won’t hurt. Unlike certain flowers that take well to shade, most vegetables need loads and loads of sunlight in order to thrive and prosper, giving you a great harvest. If you have a container garden, you can move your containers around to take advantage of the sunlight each day, although this works well only for a very small garden because of the extra work that it entails. The best chance that your vegetables have to thrive has to do with giving them great soil. The original state of the dirt in your yard is likely not going to be the best environment for growth for your veggies. Likely your dirt is either too sandy, which causes too much water runoff and will dry out your plants, or it is too filled with clay which makes the water stay and has the opposite problem. The best type of soil for your plants will be dark and loamy. Adding organic material to your soil a few weeks (or even months!) prior to planting your seeds will give it time to boost the quality of the soil. Add compost, chopped leaves, grass clippings, twigs, straw, or even manure. Make your own compost from kitchen scraps, or purchase it from a local supplier. Deciding which seeds to buy is an important factor in planting a vegetable garden. Some of the easiest and quickest vegetables to grow are root vegetables such as radishes, carrots, and garlic. On top of the soil, try growing some leafy green veggies such as basil or lettuce. All of these vegetables are excellent not only for feeding your family but also do well when sold at farmers’ markets or to local chefs if your goal is to make a profit. Once you’ve arranged for sun, soil, and seeds, the planting part of the vegetable garden is fairly easy. If you are sowing directly outside, plant the seeds about 1-2” below the surface of the soil. Water regularly, but balance it with the amount of rainfall. In a couple of weeks, you’ll need to separate and spread them out so that they can have the space they need to grow. The length of the growing season depends on the vegetables you choose. If you want to grow a garden that produces crops in a little as two weeks, try a growing system such as Seed to Cash. Providing you with seeds, a guide, and online support, Seed to Cash can help you earn up to $200 in as little as two weeks’ time.